When legislators couldn’t agree on a map to pass that lays down each one of their district boundaries, the task went to the courts. Senator Kevin Engler of Farmington calls some of the decisions made by the appellate apportionment commission … weird. The red lines are the new district boundaries, showing where lines were redrawn from the 2001 House map, with each color indicating the prior district. (By Jessica Machetta.) 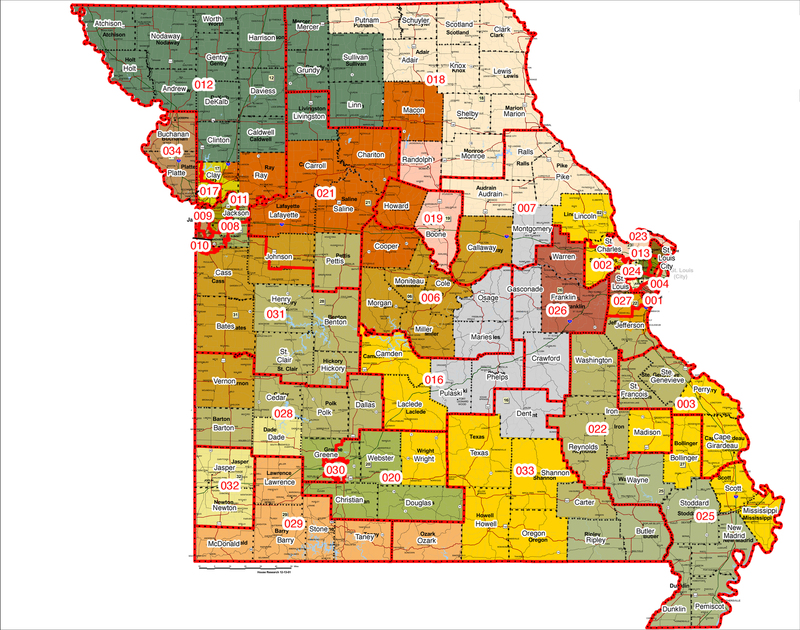 Click the image to go to the Office of Administration web site with all new map images. The commission, which was appointed by the Supreme Court, says it drew maps that comply with the constitution, the Voting Rights Act, and other legal requirements. Engler disagrees, saying it splits communities and re-aligns political parties. He says it’s obvious the panel was favoring democrats. Redistricting happens every ten years following the census. 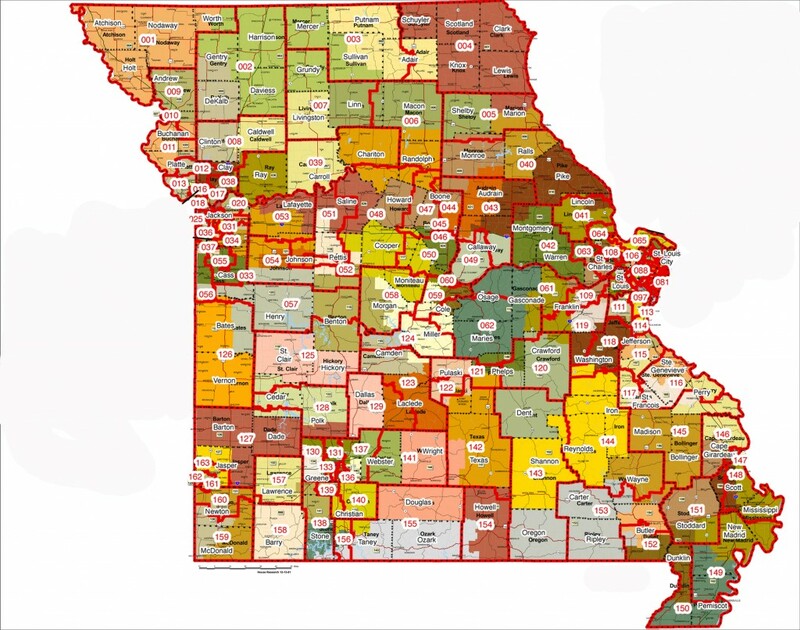 The 2010 Census shows Missouri’s population increased by 7 percent to just shy of 6 million people. The reapportionment commission says population shifts required “significant changes” in the state’s 34 Senate districts and 163 House districts. The new map puts Senator Jane Cunningham in the same district as Senator John Lamping. Engler says that makes for some tricky election choices. Districts in even and odd numbers run on different election cycles. Engler says the extensive re-numbering of districts on the new maps is going to cause several problems. For instance, Senators Jane Cunningham and John Lamping, both republicans in Chesterfield and LaDue, have been lumped into the same district. So now does Cunningham run in a district she doesn’t even live in? According to a tweet, Cunningham plans to run in the new 27th District. Engler says the commission also did not keep communities together as it said it would. The commission says the population shifts in the state as identified by the 2010 census mandated several changes. “The constitutional requirement that district be as equal in population as practicable. The Senate redistricting plan has an overall difference in population of 7.46% between its largest and smallest districts. The new plan has four African-American majority districts. The districts take effect for primary and general elections next year. Candidate filing for election to the new districts begins February 28, 2012. 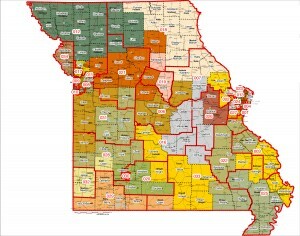 Summary maps and demographic reports describing the new legislative districts are posted on the website: http://oa.mo.gov/bp/redistricting. Additional detailed maps and census descriptions filed with the Secretary of State will also soon be available on the website. The panel comprises Lisa White Hardwick, Chair, Roy L. Richter, Vice Chair, Don E. Burrell, Jr., Robert G. Dowd, Jr., Nancy Steffen Rahmeyer, and James E. Welsh.